This year's Fall Team Championships hosted eight highly competitive teams vying to win the $500 in guaranteed prizes.After the top seeded Marauding H.U.N.S. 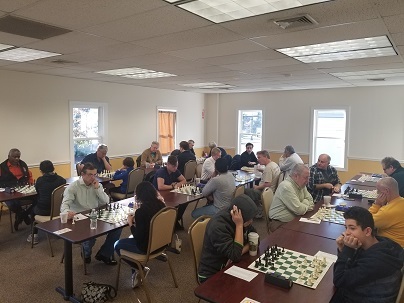 were held to a draw in round one, the New Britain Chess Club (NBCC) led by FM Nelson Castaneda took the lead and after three rounds were in the clear lead with 2.5 match points. The final round was an intense showdown between NBCC and No Draws Accepted, led by NM Oliver Chernin, with NDA needing a win to leapfrog into first place. It was not to be however, as NBCC won their third match of the day 3.5-0.5 to win the tournament. FM Castaneda was a solid board one throughout the tournament and with strong performances by NM Derek Meredith on two, Suhas Kodali on three and Ybelka Granger on four, they proved to be simply unstoppable. Led by their coach NM Arslan Otchiyev, CCFC's Varsity Dream Team finished in second place. Ethan Gu and Dream Teamers Aurelius Mlynar and Jacob Green rounded out the team. Thank you to everyone that came out to play. We look forward to seeing you again at the next team tournament in the spring!